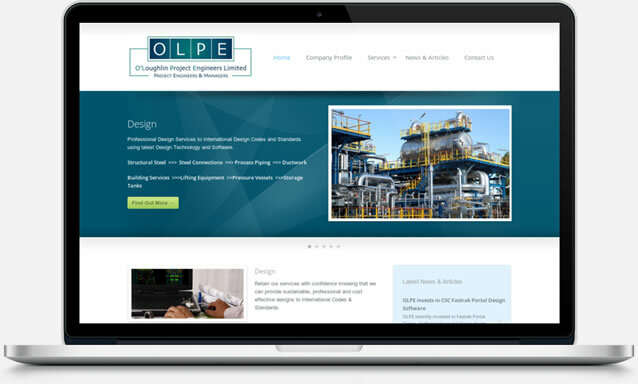 We have just launched a new website for O’Loughlin Project Engineers, based in Greenane, Co Limerick who offer specialised Steel Design and Project Engineering and Project Management services throughout Ireland. Despite the downturn in the construction industry, O’Loughlin Project Engineers is bucking the trend and its specialist knowledge of automated steel detailing technology such as Tekla Steel Detailing and Solidworks 2D & 3D Modelling have led to strong demand in their Steel Design services. The industrial themed WordPress design gets the information across with minimal distraction and the selective use of imagery gives the layout a consistent structure and corporate feel.